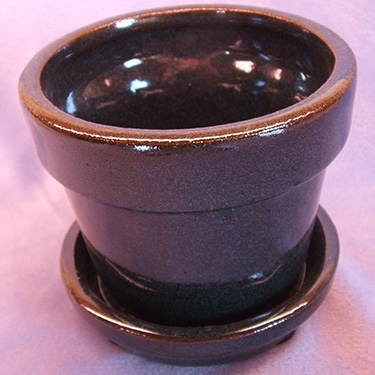 Glazed, ceramic pot with attached saucer (small hole in bottom of pot allows drainage into saucer). 3" in diameter, 3 3/4" high. Small rubber feet on saucer bottom to prevent scratching. Note: photos may appear in different sequence than color options in dropdown box. If you order with plants, ceramic items be shipped separately and will incur additional ($12) shipping costs! I received 2 in the red and neither had holes that went through the pots for drainage. Did not know this until I watered the violet i had just potted. Just hope I don't end up losing the violet because of this. I had already ordered some more pots so hope this is not a reoccurring issue.